The terms ‘you’, ‘your’, ‘customer’, ‘client’, refers to the purchaser, user or viewer of this website, Farmweld client and/or their agents. ‘We’ and ‘our’ refers to the partnership AJ&PA Hood, trading as Farmweld (Australia). The content of this website is for general information and use and is subject to change without notice. As such information is correct at the time of publication but is subject to confirmation. Neither Farmweld nor any third parties guarantee the accuracy, performance, efficiency or suitability of the information, services and products found or offered on this website for any particular purpose. You acknowledge that this website may contain inaccuracies, errors or omissions for which we expressly exclude liability for to the fullest extent permitted by law. Your use of any information, services or products on this website is entirely at your own risk, for which we shall not be liable. It shall be your own responsibility to ensure that any products, services or information available through this website meet your specific requirements. On occasion this website may include links to other products or websites. These links are provided for your convenience and information but does not mean that we endorse the product or website(s). We have no responsibility nor affiliation with products other than our own, nor for the content of other websites. All contents of this site are copyright to AJ&PA Hood. All rights are reserved. 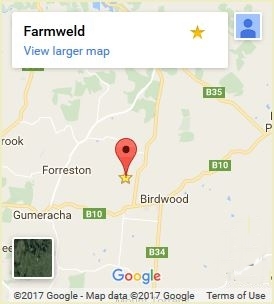 The material provided on the Farmweld.com.au website is provided for personal use and information only and may not be resold, redistributed, reproduced, duplicated, copied, hot-linked or otherwise exploited, without the prior written consent of the owners of Farmweld. This Agreement is governed by and must be construed in accordance with the laws in force in South Australia. In using this website, you submit to the exclusive jurisdiction of the courts of South Australia and the Commonwealth of Australia in respect to all matters arising out of or relating to use of this website, this Agreement, its performance or subject matter. The intention to proceed with a contract of sale may be made in writing, or by word of mouth, or partly in writing and partly by word of mouth, or may be implied from the conduct of the parties such as payment of a deposit. Sale of products from Farmweld are conditional upon your acceptance and compliance with our terms of trade, including but not limited to the following terms, conditions, notices and disclaimers set out below (‘Terms and Conditions’). All the items manufactured and sold by Farmweld are made to order and customised/custom-made for each client. Unless otherwise agreed between both parties, orders must be confirmed with a minimum 50% deposit before they are considered bona fide. Payment of the deposit confirms that you have read and agree to comply with Farmweld’s terms of trade. Any changes made after the order is placed will be at your expense. Estimated completion dates are based on when the deposit confirming the order is received, not when the order is placed. Completion dates are a guide only. As each item is custom made and vary in complexity, it is impossible to give precise completion and/or delivery dates. Some items such as hand forged items, may take much longer to make than other standard designs. Farmweld will provide you with a copy of your order. It is your responsibility to check that the details are correct before you pay your deposit, confirming the order. Customers are advised to check their orders and report any errors or omissions immediately. Farmweld is not liable for any errors or oversights if the customer has not picked them up and advised Farmweld accordingly. We reserve the right to improve, alter or modify our designs without prior notification. Colours shown are intended as a guide only. All product descriptions are correct at time of publication. If you like our work then you’ve probably already decided that you would like us to make your project for you. Unfortunately, we’ve had some bad experiences with some unscrupulous people in the past, who asked us to design things for them and then these drawings were taken and fabricated elsewhere. As you would appreciate many hours go into designing quality pieces and this has caused us considerable loss. As such we now charge a design fee, but the good news is that this is then reimbursed when you place your order with us. Drawings are presented as two dimensional concept sketches only. Farmweld does not have three dimensional CAD drawing facilities. Due to the hand-made nature of the item, there may be some variation to the finished product. All drawings are supplied as drawn from the front of the item unless otherwise indicated, e.g. right or left-hand hinging on gates referred to in any drawings is as viewed from the outside (front) of the property. Some componentry/designs have a back and front face, e.g. flowers and leaf motifs. In some cases modifications may need to be made to the design during the manufacturing process. This is generally because drawings are limited and it is impossible to foresee some issues, e.g. relating to the thicknesses and malleability of steel. Copyright of designs remain the property of AJ & PA Hood, t/a Farmweld and are not transferable. A design fee will be charged for any drawings and custom design work. In the instance of more complex designs, quotes cannot be done without drawings. A drawing fee is non refundable and covers the cost of concept drawings and up to two revisions of any one design. The design fee will be reimbursed against your order. Further amendments will incur further cost based on an hourly rate. Design fees must be paid in full prior to any drawings being done. All prices/quotes are inclusive of 10% GST. Quotes for products are valid for 14 days. Quotes for delivery are subject to final confirmation. Freight charges vary constantly and as such will be confirmed when you place your order. Payment for all orders is in advance unless otherwise specified. We accept payments via direct deposit to our bank account, via electronic funds transfer or alternatively in cash or cheque. (Please do not send cash in the post). You will be provided with payment details when we email you a copy of your order. You warrant that any drawings, images, sketches or photographs (works) which you provide us with and you request us to replicate as a two or three dimensional form, are your own original works and that you own copyright over them or are otherwise authorised or licenced to provide the works to us to use them as you have requested. You warrant that nothing in the works contains portions or sections in whole that are subject to third party intellectual rights, or that if they do then you have permission from the owner and are legally entitled to give us licenced rights. You verify that use of any provided works will not infringe on any intellectual property rights or copyright. Furthermore you agree to fully indemnify and hold harmless us and our employees and agents against all expenses, losses, claims, damages and costs (on a full indemnity basis) incurred by or awarded against us arising directly or indirectly out of any breach of these terms and conditions or howsoever arising, including any damage to a third party (including the infringement of a third party’s rights caused by your provision to us of works) or to property. All items purchased from Farmweld are conditional and made pursuant to a shipment contract. This means that the risk of loss and title (or ownership) for such items pass to you upon payment in full and delivery to the carrier, or payment in full on collection. Once items have been passed to the purchaser, their agent or carrier, they become the property and responsibility of the purchaser. If a product arrives damaged, or is misplaced, it is the purchaser’s responsibility. No refunds or replacements will be given for products missing or damaged in transit. We will however provide you with all the necessary information to make your claim. Items must be collected within 14 days of notification, or weekly storage fees will apply. In the event of payment default, you agree to pay all outstanding & collection costs including late payment & storage fees. Any litigation with be within the jurisdiction of South Australia. Items to be installed should be paid for in full prior to installation unless otherwise arranged. Installation costs must be paid for immediately on completion or in the event that the installation cost is to be calculated at an hourly rate, on presentation of a final invoice. Title of ownership on items installed by Farmweld shall not transfer till payment has been received in full. In the event of payment default, you, your client and/or agent agree to provide Farmweld or their agents with unhindered access should items be repossessed. You also agree to pay all outstanding & collection costs including late payment fees. Items may be collected direct from Farmweld, strictly by appointment. You agree to contact us to make a mutually agreeable time to collect your item. If you are more than 30 minutes late and we are not available, you will need to phone and make another time to collect your goods. Items not collected within 14 days of notification will be charged storage fees. At the time of quoting Farmweld will provide you with all the details you need to arrange delivery. Farmweld may also provide shipping quotes on behalf of clients if required. This is a service, but this does not imply our liability for the shipment. If you have difficulty in arranging your own delivery we will assist by arranging delivery (to most areas within Australia) on your behalf. Quotes provided for delivery are subject to final confirmation at time of ordering. Please note that when you confirm your order with a deposit you agree to abide by our terms and conditions of sale, including accepting full responsibility for any damage or loss of your item which may occur in transit. It is the responsibility of the customer to obtain insurance to protect your goods while they are in transit or storage. if Farmweld organises transport on your behalf, optional limited transit insurance covering loss and/or damage, with the exclusion of paintwork, may be available through Farmweld for a fee. Any excess and administrative costs for claims is payable by the customer. If your item is not insured you agree to take full responsibility for any loss or damage of your items in transit, or as a result of using our nominated carrier. In the event that transit insurance is taken under our policy, damages must be reported to us within 24 hours of delivery. We are more than happy for you to arrange you own delivery. Farmweld will provide you with the details you need. Your carrier must contact us to arrange collection. If you want us to deliver items to your chosen freight depot in or around Adelaide, you will be charged a delivery fee from Birdwood, South Australia to that location. Tracking numbers will not be provided for local deliveries of this kind. In the event that Farmweld arranges your interstate delivery, we’ll email you confirmation and include a consignment tracking number so that you can track your delivery online. Powder coat is a decorative finish for indoor and outdoor use. It gives the metal some protection, however it is not a corrosion protection in its own right. Steel items are treated with a zinc rich primer prior to power coating to guard against corrosion. The products are then powder coated to make the surface resistant and suitable for use in exterior environments. Minor rust spots which appear in areas such as welded joins and tight corners do not affect the structural integrity of the product. These are not covered by the warranty. Whilst every care is taken to provide the most suitable finish according to the use and the environment the product will be subjected to, Farmweld cannot guarantee this decorative finish against rust, scratching, scuffing, chipping or fading and as a result of use in highly corrosive environments such as seafront and/or highly chlorinated environments. When choosing a colour for outdoor use please select a suitable UV stable choice, as the product is not warranted against natural fading. To ensure longevity of this finish please refer to the care and maintenance. Corrosion/rust occurs naturally on steel and as such is not covered by warranty. Rust stains developing on painted or powder coated products will not affect the integrity of the item. Unpainted items, other than Corten steel which develops a stabilised outer shell of rust, should be coated with an inhibitor such as Penetrol to inhibit further corrosion of the item. Items used in confined areas within a chlorinated environment, high humidity and/or in a close location to marine conditions will be prone to developing corrosion at a much faster rate. In agreeing to purchase a product from Farmweld you acknowledge and accept that continued exposure of the product will continue the rusting process. Farmweld therefore disclaims and excludes any and all liability for any claim, loss or damages that may arise as a consequence of, or caused by, rust development, including any loss or damage to other property caused by corrosion or rust stains on or around the product. The term ‘raw’ steel refers to the fact that it is as supplied by the steel manufacturer and has not been prepared, painted or sandblasted after fabrication. It is as it comes “off the bench” straight after welding and fabrication. This may mean that the steel is rusty, pre-galvanised, painted or a combination thereof. You should refer to our Care & Maintenance instructions. If we create a custom product, designed solely by us, or in consultation with your or to a design provided by, or on behalf of you, we give no warranty or guarantee as to the suitability, performance or lawfulness of the design. Our obligations are limited to creating the custom product in accordance with the specifications of the design and/or brief. Unless otherwise agreed copyright remains the property of Farmweld. The structural workmanship of products made by Farmweld is guaranteed for a period of 12 months in domestic situations, or 3 months in commercial settings. Farmweld will not accept responsibility in any way for damage caused by misuse, abuse, incorrect installation or accident. Any such damage constitutes a breach of the warranty contract. This warranty does not apply to normal wear and tear. Farmweld shall not be liable for, and specifically excludes, any claims by any event or matter beyond its control, caused directly or indirectly, including incidental, consequential or contingent damages suffered as a result of the use of the product or a breach of this warranty either written or implied. Items manufactured to order are deemed to be ‘custom made’. Please be aware that under Consumer Law custom made products cannot be returned or exchanged unless they are faulty. Your goods are damaged in transit and you have declined transit insurance. As transfer of title occurs on payment in full of the items, shipping is at your own risk. In declining insurance you accept full liability for loss or damage occurring as a result of or during transit, including that to your own or a third parties property. Your goods are damaged in transit and you have taken out transit insurance. If we arrange delivery on your behalf, we instruct the couriers to call you so that you can make arrangements for delivery. You must be present to inspect your goods before signing for them as your signature may void the insurance. You are offered transit insurance and if you take up this option we cannot under any circumstance exchange or repair an item that you have signed for as your signature on the delivery paperwork means you are accepting the goods no matter what condition they arrive in. In order that we may address the matter with our transport supplier and the insurance company if need be, please take the time to check your items upon their arrival. If they are damaged, please take digital photos of the item and the damage and contact Farmweld within 24 hours of the goods arriving. Your goods have a structural fault/flaw or damage. In the unlikely event that you detect a structural fault with your item within 12 months of date of despatch, please notify us as soon as possible. In order to verify your claim, we will require you to provide photographic evidence of the fault or damage, so that we can assess the claim. It is a condition of sale that in the event that your item is in need of repair or replacement under this warranty, the customer agrees to pay for transport and shipping costs to and from Farmweld’s workshop. Damage to paintwork is excluded from warranty. Instructions for repairing paintwork can be found HERE. The wrong item has been shipped to you. If the item differs to the description on your invoice and the wrong item has been shipped to you, contact Farmweld immediately to enable us to arrange a replacement item to be shipped to you and collection of the incorrect item. NOTE: if you did not check your invoice and pick up and notify Farmweld of any error or omission on the invoice, then any replacements will be at your cost as Farmweld made as described on the invoice as submitted to you. Returns. Please ensure that the item is re-packaged to minimise damage. Items must be returned in good condition.You will not incur any additional costs if the item does not match the invoice. Your replacement item will be shipped to you as quickly as possible within the normal delivery time frame for that item. You must not use or otherwise deal with the wrong item if you know, or ought reasonably to know, that it is the wrong item. If you do use it, you will be deemed to have accepted it as a suitable, and accepted, alternative or replacement to the item ordered. Items must be packaged in materials and to a standard affording protection equal to or better than that in which the items arrived to minimise damage. This Agreement is governed by and must be construed in accordance with the laws in force in South Australia. The parties submit to the exclusive jurisdiction of the courts of South Australia and the Commonwealth of Australia in respect to all matters arising out of or relating to this Agreement, its performance or subject matter.